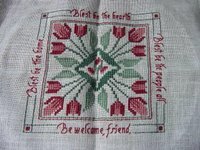 I was cleaning my desk and crafty room today and happened upon this blast from the past...a counted cross-stitch I did back in 1997. 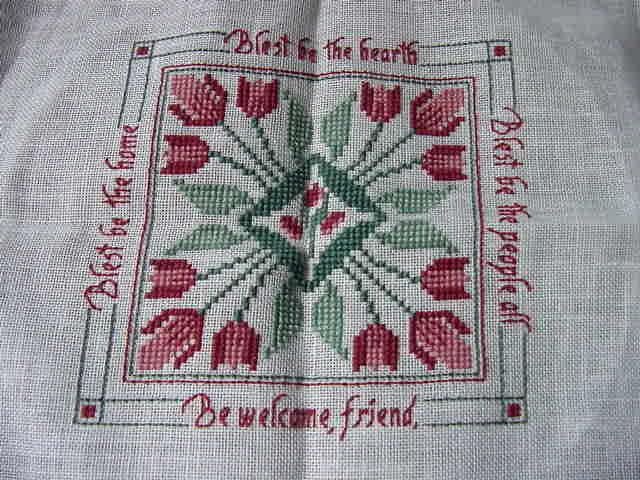 I don't have the pattern information, but it's done on linen and measures about 5.5" square. 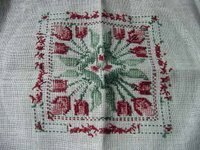 I've been very tempted lately to give cross-stitch another try. 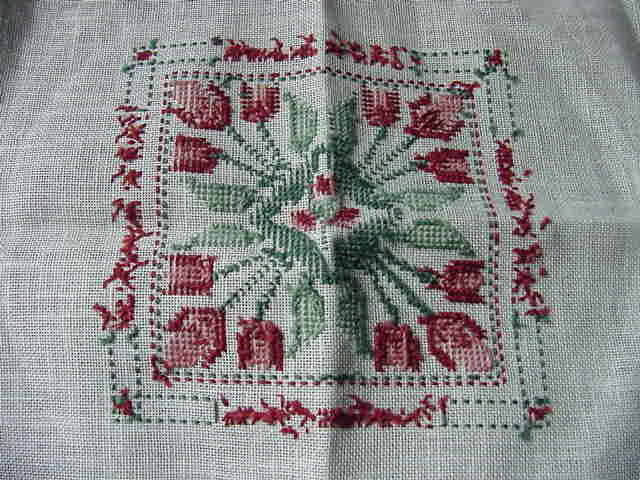 I've got too many things on my plate right now, crafty and otherwise - but maybe sometime after the new year! My KSKS package arrived today!! My pal was Debbie and she did a great job! I got two skeins of Sweet Georgia Yarn in the Willow colorway (which is actually a bit more lime than this picture shows...so soft! 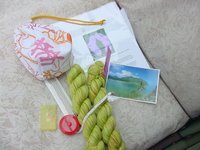 I also got a set of KnitPicks size 1 dpns, a few stitch markers, a tape measure and some lovely chocolate (not shown because sadly, ants had found their way into the packaging! just the packaging of the chocolate, though...no sign of them anywhere in the rest of the box, which I thought was a bit odd). 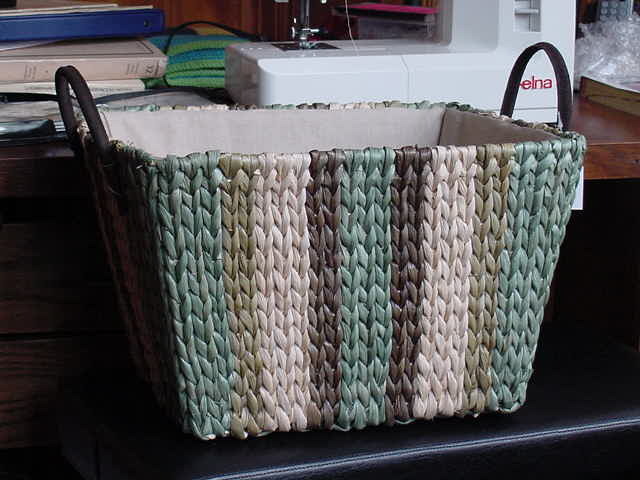 I also got a very cool project bag that Debbie made - it's even lined! 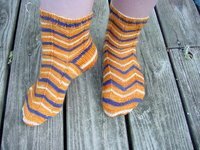 The pattern she gave me is the Zigzag Cloverleaf Socks pattern by Desi Knitter...I can't wait to try these! Today, the kids and I had to go do car stuff...emissions testing and get new tags. All of that happened to be very close to Old Time Pottery and I've been meaning to go there for a while. The main thing I was looking for was some sort of wreath or something decorative to hang on the front door. 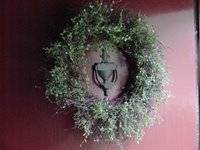 I have a lovely Christmas wreath and much as I'd like to, I just can't leave that up year-round. 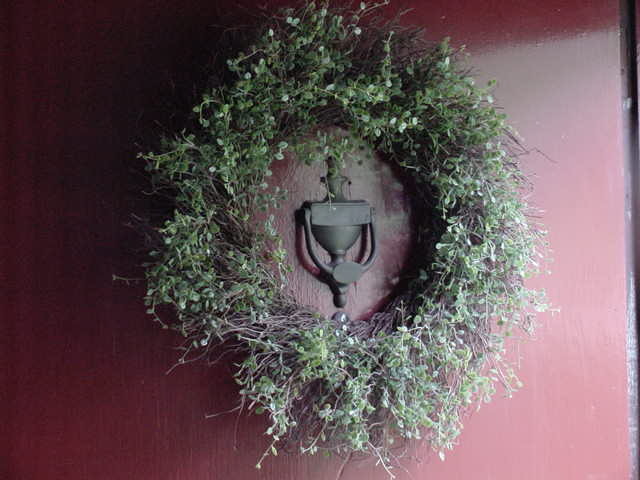 I did consider making my own wreath (I made my Christmas one), but wanted to look for something ready-made first. I was also very excited to find this...a new WIP knitting basket! Here we have the latest single sock, Hagrid. 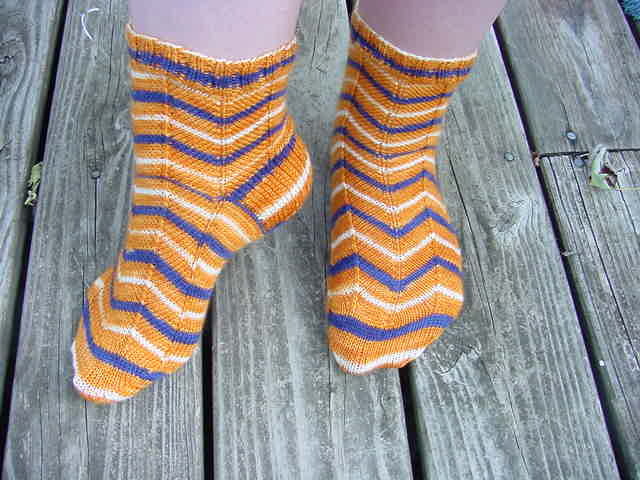 The pattern is Mock Croc Socks from KnitPicks. 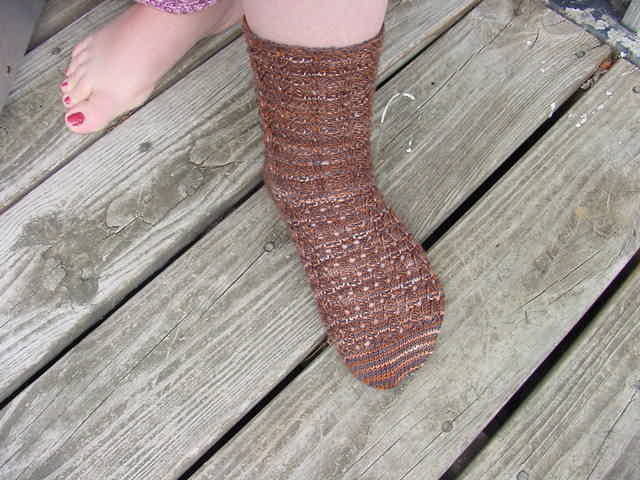 The yarn is Socks That Rock in the colorway Petrified Wood. Knit on size 2 needles. Someday I will find a way to take a flattering picture of my foot. 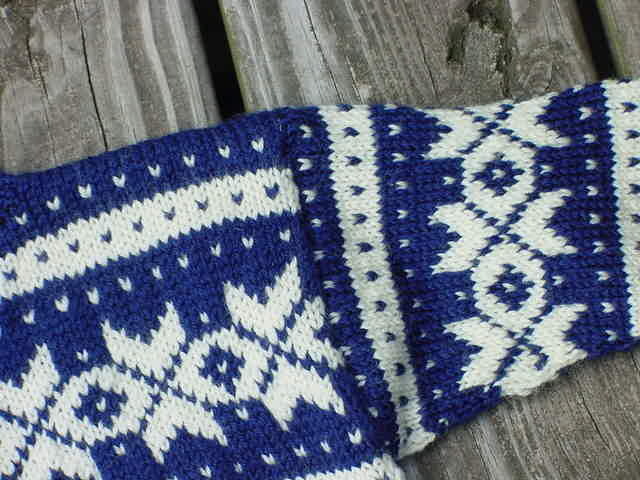 I really, REALLY like the way this sock is constructed. 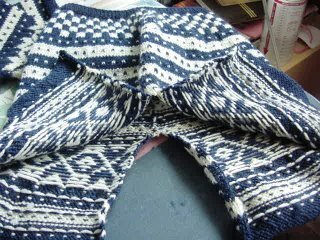 It is a plain stockinette heel flap, but the flap seems much wider than others I've done and seems to fit my heel very well. 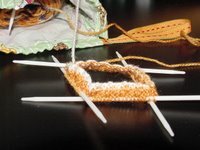 The toe is a bit more round than others I've done, too. I'm eager to get started on the second sock! It's so wonderfully brown and...well...Hagrid-ish. 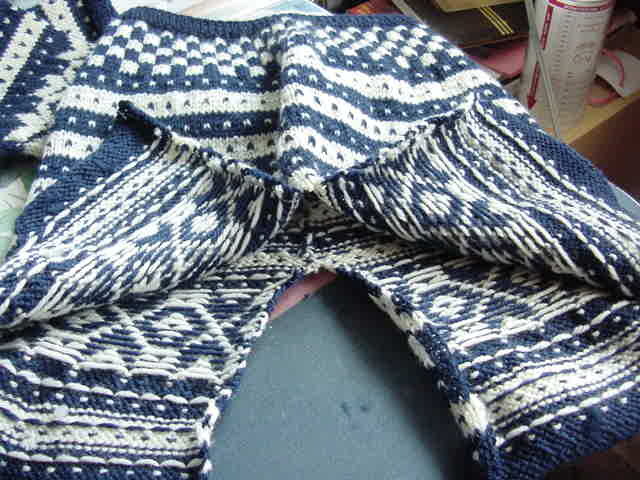 Hooray for finished socks!! Perfect timing, too, since my sister's birthday is 9 days away. Guess I'd better get these packed up and ready to mail soon! 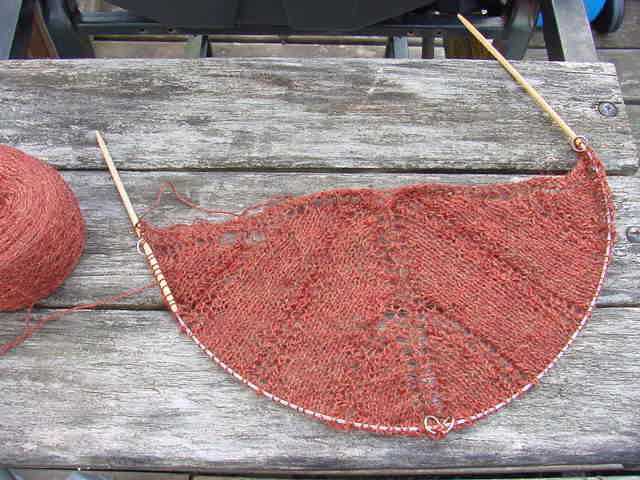 In other knitty news, I picked up an old sock out of the knitting basket and am going to finish it before going back to my Ginny and Fawkes socks. I love orange and orangey shades, but I needed to look at something different for a while! 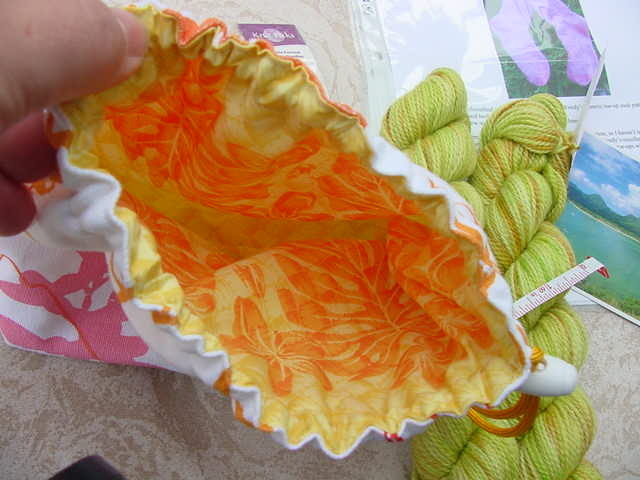 Would you prefer funky yarn or a funky pattern? either one, really, but I do love yarn! What are your favorite colors? I love most colors, so pretty much anything goes - no pastels, please! When you wear a scarf do you prefer a wider/shorter scarf or a thin/long scarf? I'd prefer a longer scarf, but it doesn't matter much if it's wide or thin. 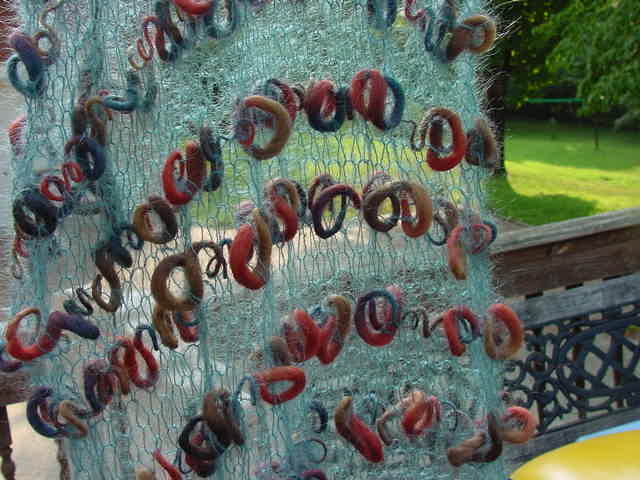 Would you prefer a functional scarf (to keep you warm) or one just to funk-up your wardrobe? either one! What else would you like your partner to know about you? I'll probably like whatever you come up with, so don't agonize over your choices, LOL! 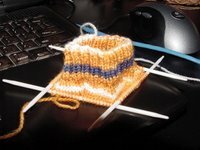 I spent some time this weekend working on my second Illini Jaywalker. I'm not sure why it was so hard to get back into knitting a sock this time. 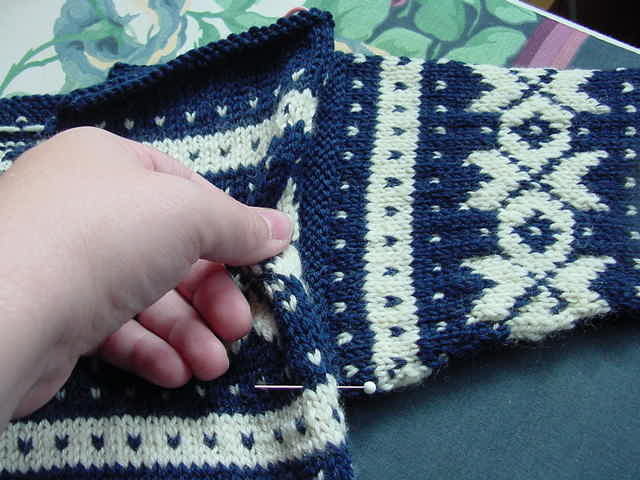 I think it has something to do with the needles I'm using - Bryspun dpns, size 2. Very, very blunt tips and a tad bit flexible. I've gotten used to the flexible part - I think my issue is with the lack of pointy tips. 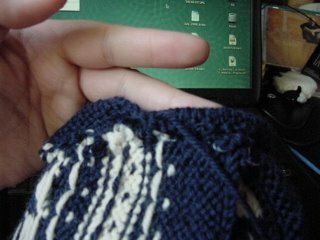 Anyway, I got quite a bit done on Illini2 and am almost finished with the gusset decreases! Thankfully, all the stripes are matching up perfectly with Illini1. In order to combat Second Sock Syndrome, I am forcing myself to work on the second Illini Jaywalker. 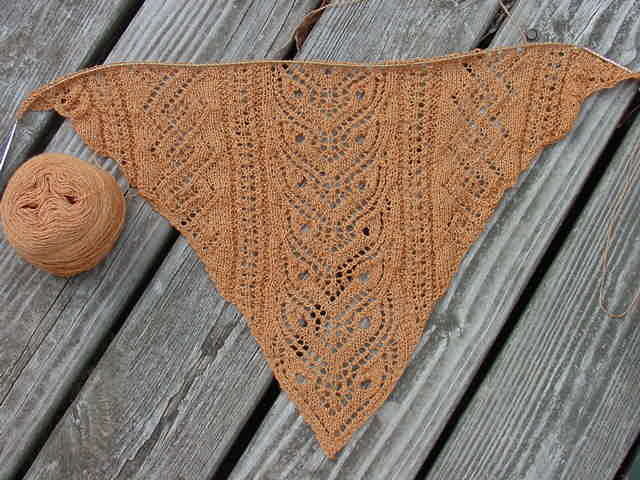 I did work on lace yesterday, but it's raining this morning so I couldn't take pics of it outside, as usual. So here you can see the slight progress I made with Illini2 last night. (pardon the bad flash) It's not much, but at least we're into the actual pattern now. 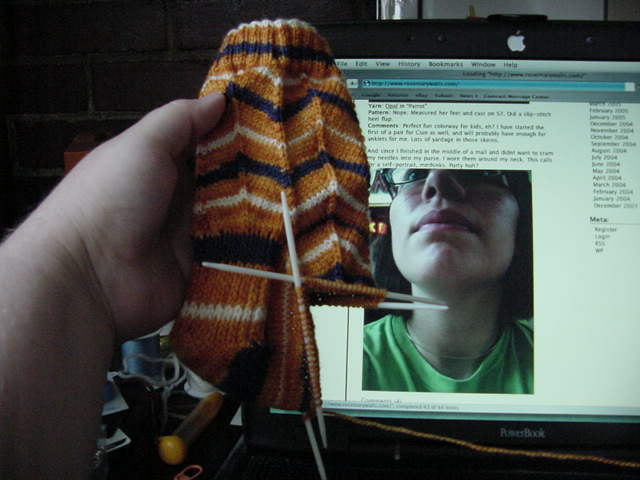 Thankfully, I did remember where in the self-striping pattern I started the first sock, so the two should match up very closely. I'm kinda itching for a pair of knee socks sometime soon. 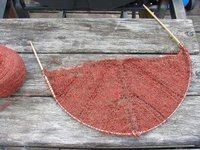 I'm sure I'll rethink that once I'm actually knitting them, but it sounds good! What a week. We had to have our dog, Maggie, put to sleep on Friday - quite unexpectedly. We knew she had some problems, but she got very sick very quickly last week and the vet agreed that if we didn't do it, we could only try to keep her comfortable. Of course, we didn't want her to suffer or be in pain and when it was obvious that she could no longer keep food or water down, we knew it was time. 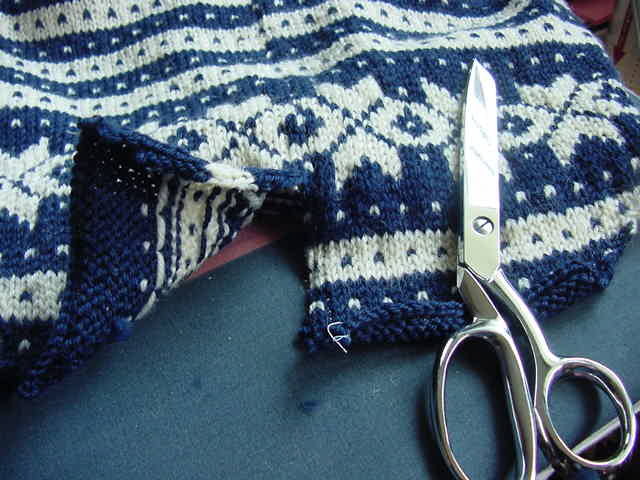 Obviously, it was all very emotional and as a result, I really had no energy for knitting for a few days. 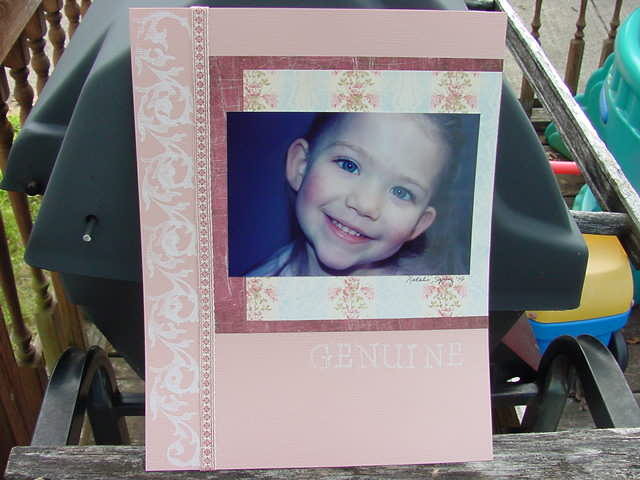 Thankfully, my emotions are leveling out and I've been getting things done again. I also started the second Illini Jaywalker. As you can see, I haven't gotten very far. I have a bad case of Second Sock Syndrome. Because...my Zephyr DID finally arrive!! And I can't stop looking at it! 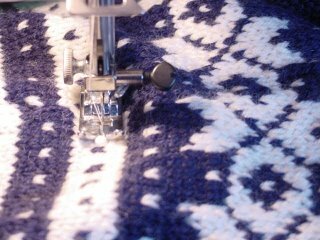 Or knitting it! 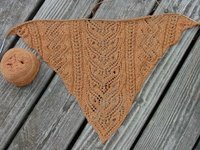 My Tiger Eye shawl is now just 35 rows from being ready to start the borders!! It's finished!! Fana would have been completed much, much sooner, but I ran out of the cream yarn and had to order more (not available locally). 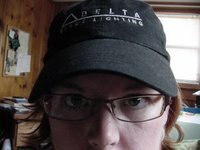 I did take pictures of the last hurrah, though, so let's walk through steeking together, shall we? Measuring and marking where the steek seams should be...note the purl rows on the top of the sleeve: this is the facing you use to cover up those unsightly armhole seams on the inside of the sweater. The only modification I made to the pattern was the collar. 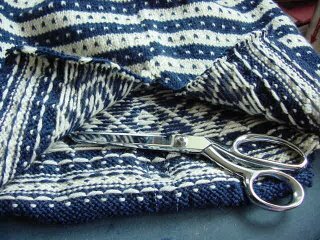 It calls for a fairly wide, double-thickness collar and we just don't need that here in TN, so I just made a regular crew neck. 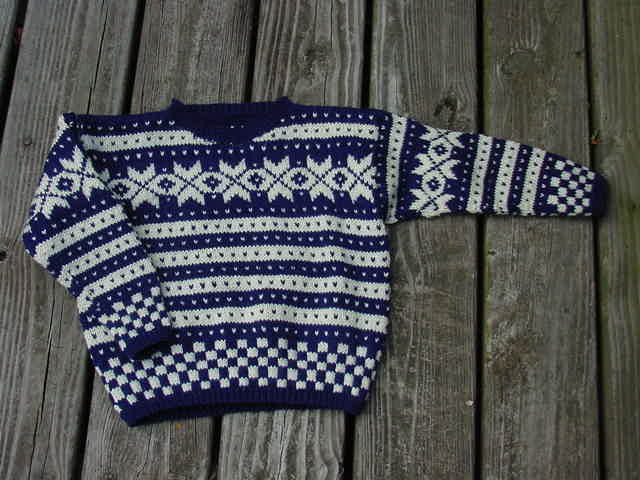 Perhaps not true to the Norwegian spirit, but a little more practical for the actual wearing of the sweater, I think. 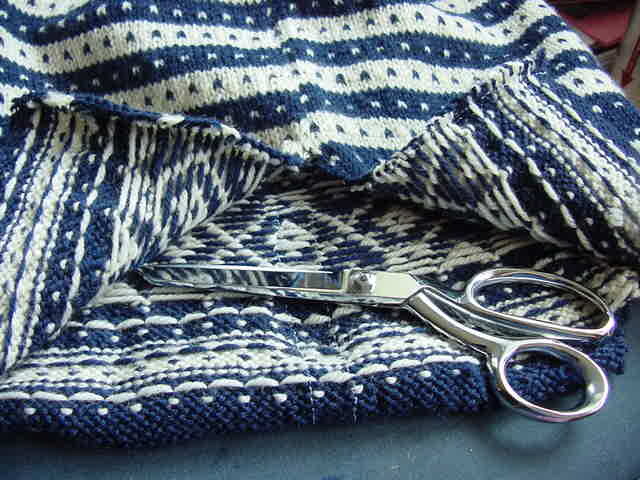 All in all, this was very fun to knit and the steeking was really not that big of a deal once I was actually doing it. 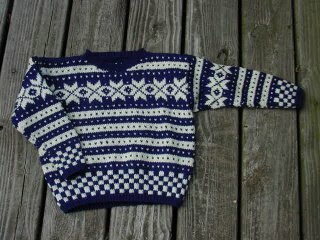 So if you're looking for a first Fair Isle sweater project, check out Dale of Norway's Fana! 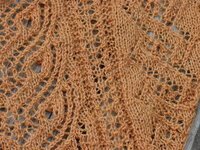 First, some scribble lace! 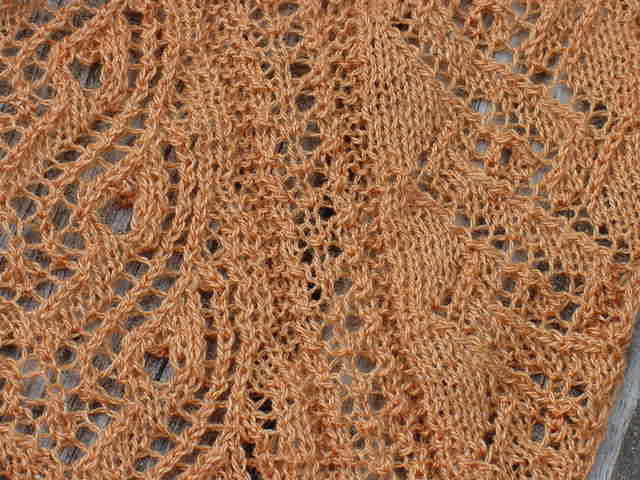 This is Rowan Kidsilk Haze and Berroco Hip Hop, worked on sz 17 needles. 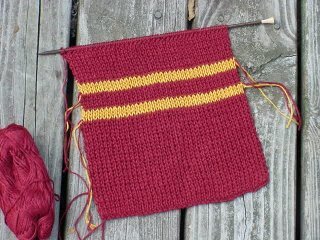 Next, the start of my own Gryffindor scarf! 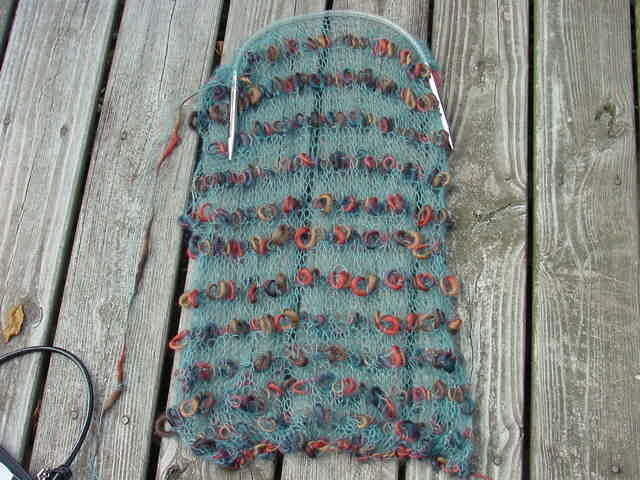 I'm doing the 1x1 rib version with SWTC Pure Soysilk on sz 6 needles. The actual colors are a shade darker. In real life, the gold isn't bright at all.